One of the big games of 1993, starring Sega's iconic blue hedgehog and his mate the.....erm....what was Tails again? Apart from annoying? Well anyway should this be a burst of nostalgia or packed away with your copy of Mr Blobby's song, well let's find out. Absolutely nothing new here whatsoever, get from point A to point B, dodge enemies, collect rings - that's it. It is a very easy game, and I mean VERY easy. I am not the most talented game player by a long way and I beat the game in 20 minutes. 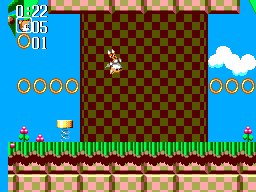 Graphics are a pleasant surprise in terms of the sprites used for the characters, the backgrounds are less well thought out, giving the game a bit of a 'Friday afternoon' feeling, along with the short levels. The levels seem a bit rushed and this extends to the background graphics, you will find yourself killed by something that you havent seen until after it has killed you. The sounds are the strong part of this game, anyone that has ever played Sonic on any plaform will be aware of the funky style of the in game music, and this game very much sticks with the established theme. A mixed bag if I am honest, mostly fine until the last two zones, everything gets a bit complicated for the AI to handle and things get a bit too slippy to be fun. It is at this point that I started to think of all the other games I could have chosen to play instead. Honestly, not much. Once you have beaten the game, which believe me you will very quickly, thats it. 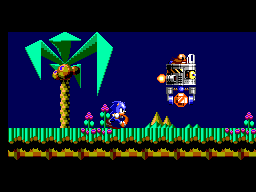 One of the boss battles was so buggy that I was able to place sonic on top of the boss, bouncing him off the top without even needing to touch the controller and still won. 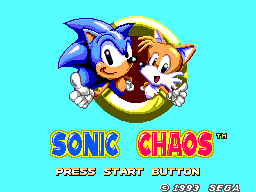 Sonic Chaos should be called Sonic Friday Afternoon Rush Job, there are much better platform games, I feel sorry for any kids that got this as their only new game for Christmas 1993.